A view from the cycle path: A great weekend in Germany. The Big Oldenburg Recumbent Meeting and a piece about "Bike Culture"
A great weekend in Germany. 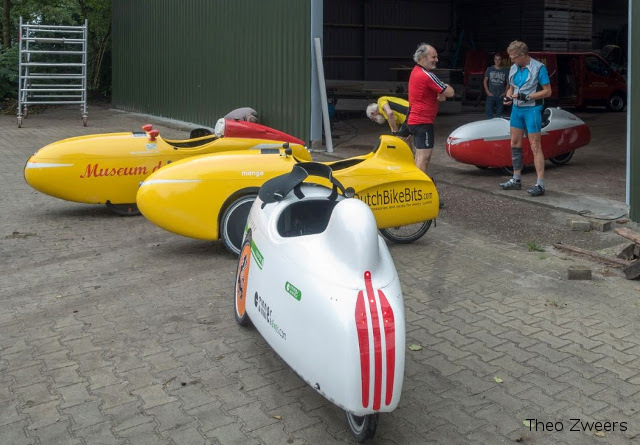 The Big Oldenburg Recumbent Meeting and a piece about "Bike Culture"
It's a few months now since I first read about the Großes Oldenburger Liegeradtreffen (big Oldenburg Recumbent Meeting). That this event was going to happen came at me from three directions at once: It was listed on the ligfiets.net website, and two friends who also had an interest (Theo who is local and Klaas who I know from Cambridge but who now lives in Oldenburg). Thanks to the Schengen agreement, cycling to Germany is no problem at all. There's no checkpoint, there are no customs officials, you don't have to show your passport. At the border there are a few signs and the cycle-paths and roads look a bit different on either side. Having grown up on islands from which it wasn't possible to reach a border without a ship or aeroplane, it still gives me a bit of a thrill to be able to cycle to another country. 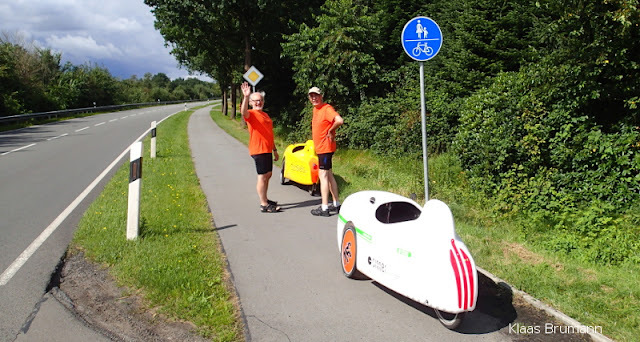 The shortest route to Oldenburg from here is about 130 km in length, but Theo and I decided to take a longer route so that we could first meet up with two other velomobile riders from further west who would camp overnight in Groningen and then join with a group of Germans riding from Leer to Oldenburg. Just before 11 am in Oude Pekela, Groningen. Meeting George and Jan, who rode from Noord Holland the day before. Travelling as a convoy of four between Oude Pekela and Leer. 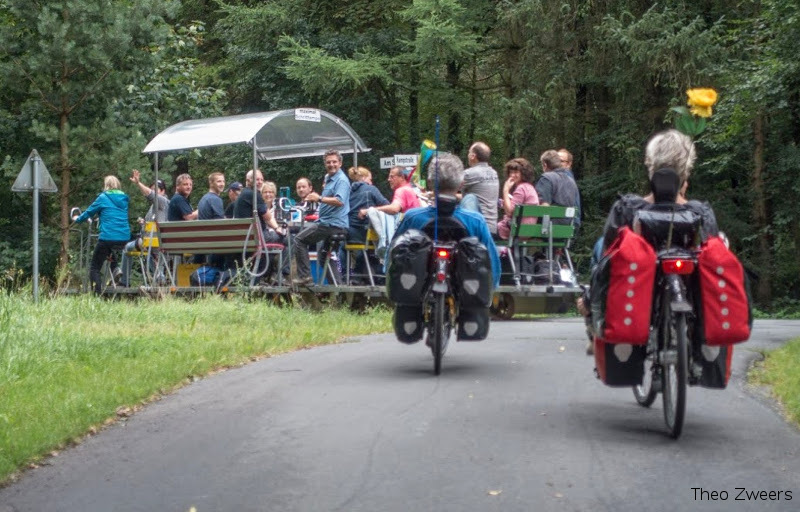 In order to be able to make good progress we ignored nearly all German cycle-paths and rode on the roads. The first part of the ride went by quite quickly. Sadly, it rained quite a lot, sometimes quite heavily. We rode through quite a bit of Groningen countryside before crossing the border and our first stop was in Bunde where we stopped for coffee. At this point I also bought a map - I tried to buy one before leaving home, but there was no decent cycling map of this part of Germany available in Assen, so it was just as well that someone else knew the route. After Bunde, our next stop was Leer, from where there was to be an organised ride to Oldenburg starting at 14:00. The first 90 km covered, we ate lunch by our bikes at Leer railway station. We were here nearly an hour early and a lot of local people asked questions about what we were doing. Our hosts in Leer before setting off. From Leer to Oldenburg we had local guides who took us by a very attractive route of around 70 km, mostly along minor roads between the two cities. Our guide very generously took us to his home for an extra lunch ! A marvellous spread. When we stopped by a railway crossing the last thing I expected to watch go by was this human powered bike / train / pub! After 160 km, we arrived in Oldenburg just in time for dinner. First we put the tents up as that's no fun after dark. The GOL is a social event more than it is a bike ride. The big ride on Saturday was not a long ride or a fast ride. It was never supposed to be either of those things as it was planned to be only a little over 40 km in length and it was supposed to take all day. 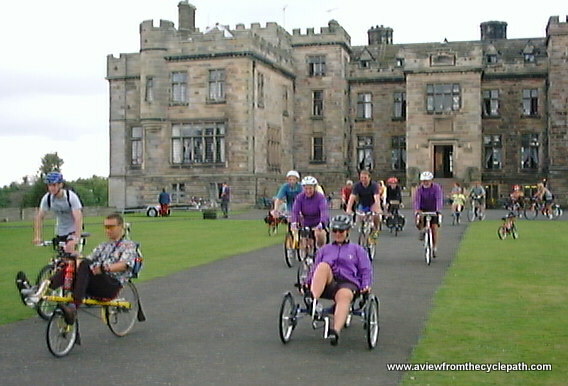 However it was a big ride in that over a hundred people took part. 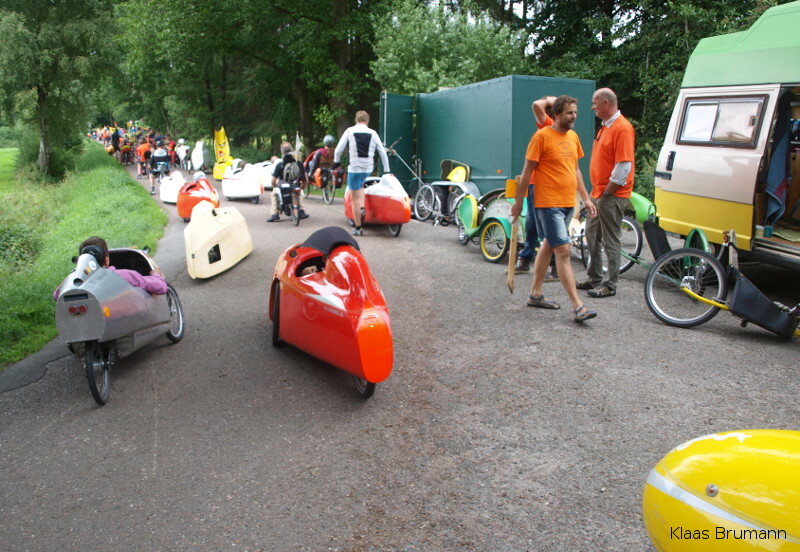 Speeds were low, roads were filled (Oldenburg's cycle-paths were not adequate for us) and traffic jams were caused. Our third stop, where we ate lunch, was by a lake where there were activities and various interesting machines being demonstrated. 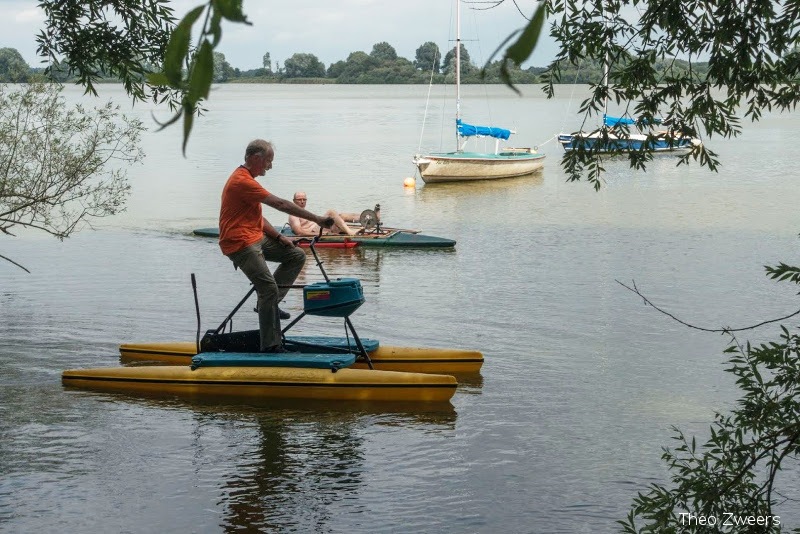 Unfortunately, this human powered hydrofoil couldn't be demonstrated. Other novel designs of boats were in use. If we had tried to ride on those narrow bidirectional cycle-paths, this would not have worked out (see articles about cycle-path widths). In the evening, there was a "cycling cinema", singing, comedy routines (lots of laughter, but I understood very few of the jokes because I don't understand German) and many prizes were awarded for people who had done particular things. Even I won prizes. 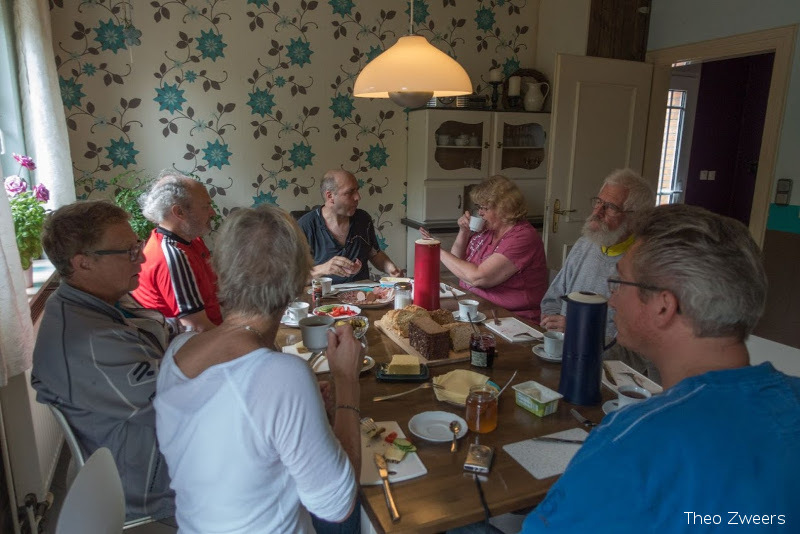 I was one of those who had ridden from the Netherlands so was given a book of over 5000 cycle friendly accommodation addresses, and then I also received a water bottle because I've ridden a recumbent for more than 20 years ! The GOL was a very enjoyable and entertaining event. Lots of effort had obviously been put into the organisation and this paid off because everything went very well. It reminded me of similar events which I've attended in the past in the UK. This was a celebration of cycling and in this case a celebration of a particular subculture of cyclists - people who enjoy the comfort of riding recumbents. There was a similar ride on Sunday. This had been advertised as optional. Theo and I both had other commitments so we decided well in advance to head home on Sunday. Klaas guided us out of the city, giving an interesting tour of some of the cycling infrastructure of Oldenburg (more on this later), leaving us on the Küstenkanal which leads back to the Netherlands. The cycle path along the canal took us most of the way to the border. Saying goodbye just South of Oldenburg just before lunch time. This cycle-path led us almost back to the Netherlands. It's a little narrow and this requires a bit of attention when someone comes the other way, but otherwise this works really well. Klaas warned us that the cycle-path became bumpy a bit later on. What we actually found was that the cycle-path had been dug up (presumably for resurfacing) and we were sent on a signed detour onto country lanes. Later on, the cycle-path continued through an area where the road was being resurfaced. Bridges took us over canals, rivers and roads. Sometimes the path really was much too narrow. At this point we had to almost stop. Eventually we reached the Netherlands. Germany behind us now (the wind turbines are in Germany). Note the lack of cycle-path immediately over the border ! It's coffee time so we sat and watched other people cycle past our bikes. In need of calories, I opened the Oranje Koek. Yes, in the Netherlands, "orange cakes" are actually pink. Cycle-paths on this side of the border are generally wider and of higher quality. e.g. this one heading back towards Assen. In these conditions a velomobile is remarkably efficient. Even though I was carrying a lot of weight and nearing the end of a 140 km ride today, it wasn't difficult to keep the speed above 30 km/h or indeed above 40 km/h at this point. I was back home in time for dinner. I spent much of the time in Oldenburg with the Dutch group because I unfortunately can't understand German. All the Dutch participants obviously enjoyed the GOL but it was clear that there was a bit of a culture shock for some of the Dutch attendees. The idea that we should want to gather in a large group and then set out on a relatively short and low speed ride seemed to be a foreign concept. I think I can explain this. One of the things which initially surprised me about living in the Netherlands is that there is very little "cycling culture" in the form to which I was accustomed when I lived in the UK. with the GOL photos. These were very enjoyable holidays. I think it's quite logical that this type of "culture" hasn't arisen in the Netherlands. Cyclists are not an out-group in the Netherlands. Because there are good conditions for cycling (almost) everywhere and because everyone cycles, there's no particular reason for Dutch people to identify as "cyclists" or to seek out places to ride their bikes in groups because it leads to them feeling safer. Elements of the GOL ride resembled critical mass. Because there is real mass cycling in the Netherlands and an acceptance of cycling, there's no need for anyone to organise critical mass here. CTC organized event 15 years ago. When I took part in my first cycle race after moving to the Netherlands I found out with a little surprise that races in this country were very much the preserve of the fast. 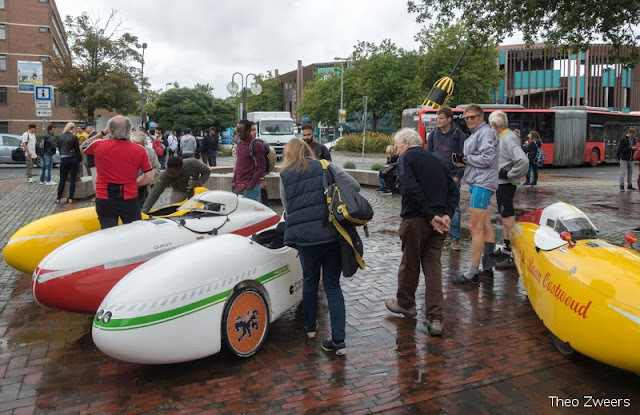 Similar events which I attended in the UK attracted not only the fast but also a far wider range of people, some of whom took part in large part because this was an opportunity to ride in a place without motor traffic. 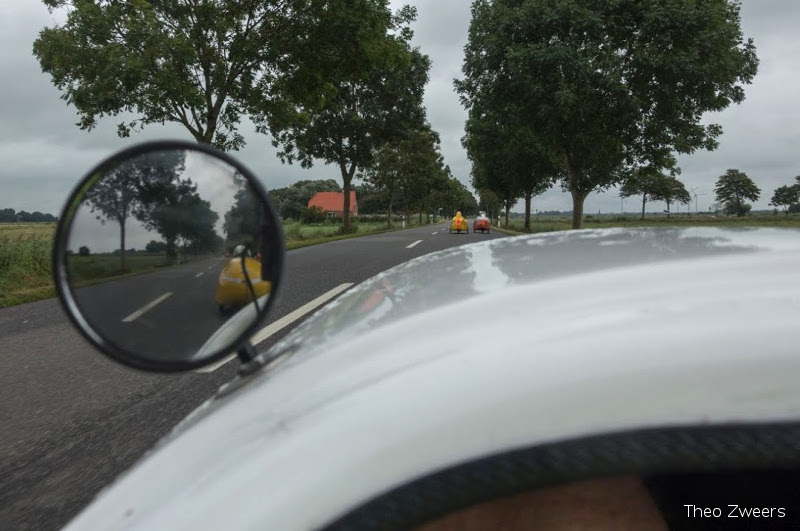 Similarly, touring rides in the Netherlands tend to take place over longer distances and at higher speeds because the people taking part are usually only the most enthusiastic. I've never found a Dutch equivalent of the relatively relaxed touring style of CTC rides in the UK (CTC is sometimes said to stand for "Cafe To Cafe"). With regard to cycling, Germany is between the Netherlands and the UK. There's a pretty good grid of cycle facilities across much of Germany, certainly across the parts which we rode through last week, but the quality is compromised enough that it suppresses cycling to a degree. While Oldenburg is a university city and has a creditable modal share approaching Dutch levels, the cycling modal share across Germany is about a third that of the Netherlands (this still means it's around 5 or 6 times so high as the UK or USA). the top off my Mango this year. I've done quite a bit of maintenance on the Mango recently. Having taken the top off it was possible to give the machine a good clean. It's surprising how many little unreachable corners there are which can accumulate dirt. The chain, front chainring and cassette were worn so these have been replaced. My front tyres were worn through to the puncture resistant strip and I've replaced them with a new pair of Marathon Racers (a thinner, lighter and more supple version of the Schwalbe Marathon). When I originally built this Mango I decided to have just one the mirror, but I've now also fitted a second mirror on the right, helping me to keep a good view on all sides. This is especially helpful when riding on a bidirectional cycle-path which is on the "wrong" side of the road. But while the Mango had lots of new bits, not everything used on this trip was new. The tent which went with me on this trip is exactly the same one as travelled the length of the UK with me ten years ago. The Paas- and Herfsttreffens of the NVHPV are about socialising! 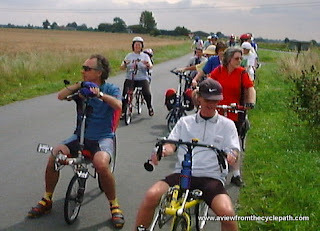 And recumbent cyclist are an out-group in the Netherlands too. The GOL-group cycled so slow, two-weelers had to have a foot on the ground. I think it's is a lot easier talking to you neighbour while cycling a little faster with two feet on your pedals. Hi Belle, thanks for your comment. I've added a link to your story underneath the post. Please note that I didn't mean anything as a criticism of the Dutch. I chose to live here because I like the people and the cycling ! Almost all Dutch people have a huge amount of experience in cycling. This comes through from childhood and it leads to cycling being relatively easy. However it's not the same everywhere else. It was certainly advantageous to have three wheels for the GOL tocht. I do wonder if the style of cycling is in part responsible for the greater popularity of open tricycles in both Germany and the UK. Did you pick up a copy of the local Oldenburg ADFC magazine SattelFest ? This provides another example of a different cycling culture. Take a look at the central pages and you'll find a list of all the organized rides July to December. Each ride has an advertised speed. Most are in the 14-18 km/h category, the others are in the 17-21 km/h category. There is also a third speed category of 20-24 km/h but none of the advertised rides are at that speed. With the possible exception of some days on the Fietsvierdaagse (which is a different thing again), I've never been on a social ride in the Netherlands which didn't travel at a higher speed. The ride write-ups in the German magazine tell a story too, describing a "gemütlichen tempo" and discussing which cafes the group stopped at. 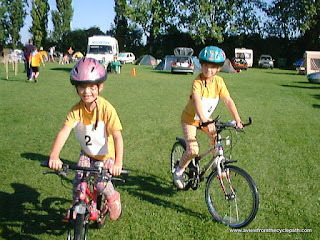 One young woman who came on a cycling holiday with us in the UK had actually never learnt to ride a two-wheeler. Remarkably brave, she came along hoping not only to socialise but also to learn to ride. Lots of people helped her and she did very well in the week long holiday. However, it was just as well that someone else brought a tandem and the usual stoker was willing to swap to another bike as that's how she joined in on the daily activities. In this land, where everyone is a comparatively experienced cyclist, such a thing could never happen. None of this is better and none of it is worse. These are just different ways of enjoying cycling.